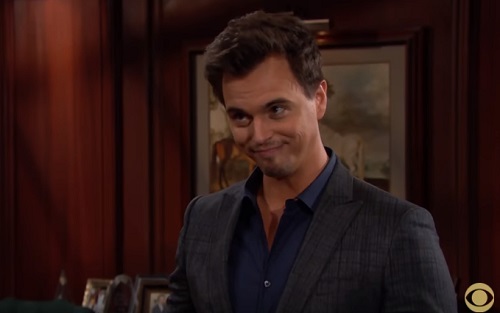 The Bold and the Beautiful spoilers tease that Wyatt’s (Darin Brooks) hope that he and Katie (Heather Tom) can remain involved, while not getting married is nothing more than a pipe dream. The fox, as Wyatt referred to Bill (Don Diamont), will surely learn that Watie isn’t over. That will certainly spurn trouble regarding custody of Will (Zane Alexander Achor) and potentially threaten Wyatt’s place in the family company. Bill walked into his office while Wyatt was on the phone at his old man’s desk. One of Bill’s two adult sons looked quite comfortable in the Chief Executive Officer’s chair. A mostly non-responsive, one-way verbal exchange then took place. It wasn’t nasty, but served to reenforce Bill’s place at the top of the food chain. Wyatt wanted to bury the hatchet, based on his review of recent events, expression of gratitude that Bill wasn’t dead and hope that both men could get along, despite what happened before the shooting. Bill had none of it. Dollar Bill doesn’t want to see Wyatt marry the mother of his youngest son. No way, no how, never. Bill actually stated that if Wyatt didn’t drop his wedding plans that he would be out of the company and Katie would lose Will in a custody case, though that last point isn’t controllable. Wyatt pled his case, but to no avail. He then bee-lined to Katie to relay the bad news. Watie has been and remains a good-chemistry couple. They appeared unlikely to be separated by TPTB at B&B. So, for the moment they won’t be. It’s actually a logically compromise that many viewers can surely relate to. Though their recollections surely date back to when they were teenagers, which is how Bill thinks of his 30-plus year-old son and 40-plus year-old ex-wife. Wyatt doesn’t have Liam’s (Scott Clifton) constitution. He’s not a fighter and liked the deal Bill offered him. If Wyatt drops the nuptial plans, Bill will step down from Spencer Publications within five years. Wyatt will be provided with a legal document that assures he’ll succeed his dad. Watie believes they can actually fool Bill into either not knowing they’re still seeing each other, or have him go along with said non-marital connection. Plus, Wyatt doesn’t seem to realize that any legal document Bill provides today could be overridden by various developments long before 2023 arrives. But he’s willing to go along with this compromise. Watie keeps smooching, among other things. Bill stopped the wedding plans, but is still in charge. No, Wyatt and Katie haven’t and won’t fool the fox. The Bold and the Beautiful Spoilers: Sally Helps Liam Begin To Cool Off – Will He Forgive Steffy?